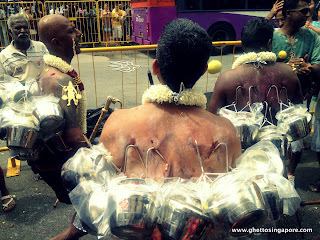 How to think, not what to think!!! So the robber shot a number of holes through the carpenter’s coat. “And now…” continued Moishe. “That’s all I wanted to know!” said Moishe. It's never too late to use our brains to get out of a difficult situation!! A blog is a type of website, usually maintained by an individual with regular entries of commentary, pictures, videos, descriptions of events, and some other material. 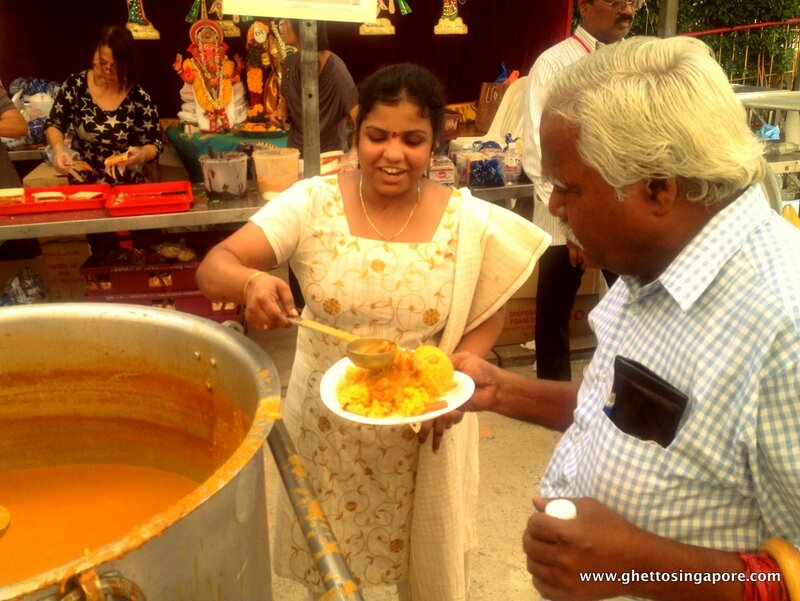 The blog is a way to communicate with others along with sharing your experience online. 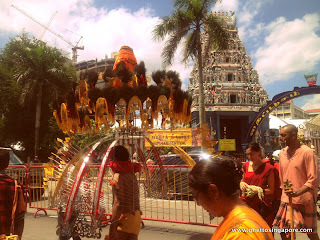 But nowadays, you can do a lot of things using your own blog. For example, you can turn it to an excellent earning machine. If you want some real life stories of inspiration as a proof, just google \”blog earners\” for example, and you will discover that many people are making real money online with blogging. You have to own a website if you plan to earn money on the web. Website is a must if you want to get into the Internet to make money. Creating a new website certainly requires website building knowledge. You must possess the skill of web design to start building a new website. However, the advance of technology has changed everything. These days, building a website is getting easier with the use of website builder. The website builder is designed for the people who have no technical knowledge in the web design field. They can just build a new site by using these website builders without having to know about the HTML coding. Xsitepro is a recommended website builder if you like to build a website without any technical knowledge and skills. By using Xsitepro, you can build a website with clicks of mouse and filling out some necessary columns. But you do need to spend some time to study some HTML code and also refer other designs. This will help a lot in creating a professional website for your online business. How to generate revenue with your website? There are several ways of optimizing your website to make money online. First of all, you can put the contextual ads up on your website pages. These contextual ads are often provided by the third party ad networks. Google AdSense is a good ad network that you can join to display AdSense contextual ads and earn click revenue. Also, offering ad spaces on your website to the advertisers is another idea of generating website revenue. Do you want to start making money online? Looking for a new and exciting career or just a little extra money to help pay the bills each month? If you are then you have come to the right place as the Web Money World website if full of tried and tested money making opportunities. In fact the only problem you may have is deciding which opportunity to go for. Whether you are new to working online or a seasoned veteran our site will give you all of the help, advice and information you need to be as successful as possible when you make money online with the web money world. There are so many different ways on how to make money online that it can be hard to know where to start. Blogging, eBay, freelancing and building a website are all great ways to make money and they are just some of the opportunities you will find information about here. Our site aims to be a comprehensive resource of the very best ways to make money online. We have included information on all sorts of opportunities from the simplest to the most advanced and we are sure that there will be something for you. What you choose to do will of course depend on how much spare time you have and the amount of money that you want to earn. So even if you can only spare 30 minutes a day there will be a way of making it pay. Whatever you want to achieve online we are here to help you do it. Having a website, blog or forum can mean you are able to make money with a website in many different ways but with so many different ways to make money online with a website, it can be a little confusing for a first time money maker who wants to get the maximum funds out of there website. So we have put together some ideas to get you started on your merry way to earning real money with your website. So what are the different ways you can actually make money with a website, we have listed a few top earners that are able to make the you the most money if used properly. Remember what every way you decide you want to make money with your website then you have to use it to a level it does not annoy or ruin your site, you do not want visitors leaving because there are pop ups and ads splashed all over the place. Affiliates are one of the bests ways to make money with a website, you must always use them in line with the theme or subject of your website, do not puts ads about flowers when your website, blog or forum is a gardening sites, you must complement your articles with useful ads that will help not hinder the visitor. Adsense is the biggest ad serving network since time began and can bring in much needed revenue if positioned well, read AdSense guide to getting the maximum number of clicks from one website. It has all you need to know FAQ and tips and trick through to becoming a partner with AdSense. Build your own email list, this can be the most profitable way to make money and can give you a totally free second income through email marketing, that can make you money each month you send out your newsletter or updates. You include affiliates or links to your pages offers, new products or bargains and will bring many visitors back to your website time and time again. If you are interested in making money online then we have put together the top five all time greatest ways to make money online, all these different ideas can be done part time or full time and obviously the effort and time and effort you invest into them the more money you will be able to make from it, for an extra income or just to give you some extra money at the end of the month. But if you are dedicated and put a lot of effort into them then you can make a good living doing just one or a few ideas below. EBay, Amazon and eBid are all great websites with many millions on each all looking for a bargain or the latest collectors items or antiques. You can start just selling your unwanted stuff lying around around the house to get started and if you are successful at this then you should think about buying products to actually sell online. Buying in bulk, selling antiques or collectors items have the best price tags and if you find a real treasure then you cans ell it online for a great profit. If you are looking for places to buy in bulk, antiques or collectors items then check out your local newspaper for Car boot sales, church fetes or auction houses these are the best places to find a bargain that you can make good money selling to people online. YouTube is a huge website and is run by the ultimate search engine of all time Google, this means there are millions of viewers online at one time so getting views on your latest videos are easy if you know what to film and what people like to watch. Funny, stupid, educational, How to and so on if you are good at something then do a tutorial. The way you make money with YouTube is through AdSense, you simply go to settings and activate AdSense to show on your videos and the more views and clicks you receive the more money you will make. Amazon Mechanical Turk is run by Amazon as a website for big businesses or individuals to out source some of there boring tasks like putting names to objects and sorting them into subjects, the work can be very soul destroying but you can make good money doing the simple tasks. 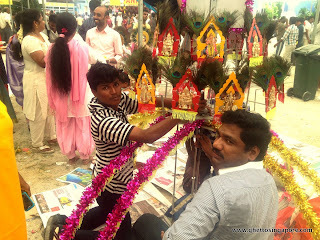 If you complete all your jobs on time and use there training guide then you get the pick of the jobs and are paid more for your time as you have a better reputation among other workers on there, but you are evaluated all the time and can lose your status if you are late in completing a job or complete it poorly. Free blogging websites like hub pages and Squidoo are great websites if you have some good ideas to write about, you can earn money with Amazon, eBay, Chitika, AdSense and hub pages own ad network which is a great addition to making money with the other four. Doing odd jobs online, if you have a skill or experience in website design or can write a article for just about anything then doing odd jobs online could be a great way to earn money in your spare time. If you have any ideas you would like to do, writing, reviews, forum admin, chat room host then there are many webmasters looking around for this type of jobs where you are paid a small amount for a job that can take five minutes, the bigger the job the more you charge. You can find many odd jobs on Gumtree or craigslist or advertise your own on Fiverr. These days it seems every man and his dog has a blog or even a blog about a dog. Travel blogs, sports blogs, business blogs or even blogs about taking the kids to school are all incredibly popular and there is no subject that isn’t blogworthy. The question is can you make any money from a blog? Your blog may attract thousands of visitors each day but how do you go about turning these visitors into cold, hard cash? OK we may be getting a little ahead of ourselves here. Let’s have a look at the basics of blogging before we get to the money side of things. To start with you need a subject or subjects to actually blog about. This should be the easy part. Have a hobby or special interest that you can share your knowledge of? 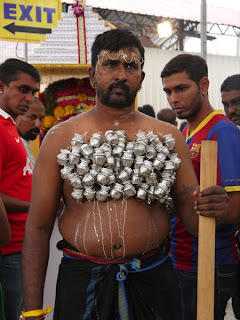 Fanatic follower of a football club, band or artist? 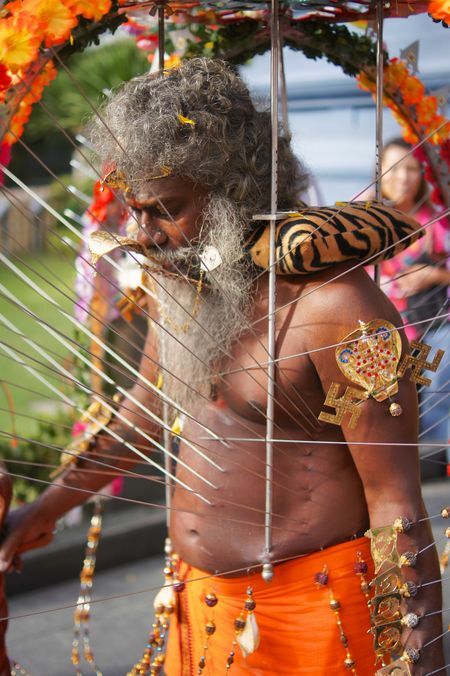 Have specialist professional knowledge and tips you can pass on? Everyone has a blog inside them and once you have chosen your subject these are the next things you need to consider: time, niche, traffic and money. So let’s have a look at each in turn. It is important that, as a website owner, you understand the connection between your search rank and your success. Use this article to learn the ways to move to the top of the rankings through search engine optimization. Begin by taking time to understand how search engine optimization operates and what positive results it can give to you. Keywords help decide where a search engine ranks your website. In the real world, the vast millions of Internet sites must be ranked using data mining technology that can review a complex list of factors using search algorithms to determine the relevance of a given website, and do it quickly and repeatedly, as the group of sites changes over time. When you pursue SEO techniques, your goal is to get higher search engine rankings. You do this by utilizing techniques that are known to increase page rankings. When ranking your website, search engines consider a number of different factors. One of the things they look at is the keywords that you are using in your content and headers. Another factor that search engines consider is the level of activity that your site generates. Here are a few tips on how to avoid being scammed online they are very simple and easy to stick to if you make money online. Never pay a website to view the latest jobs, vacancies or offers to get you employed online, they will be either fake or never excited. If it looks to good to be true then it is and this website should be avoided, i mean the offers that will make you a millionaire over night for 9.99. Never give out personnel information to a website offering to sell you the latest ebooks, exclusive videos or offers. Do not be fooled by what you see online there are many website showing fake account with click bank, AdSense that has 1000£$ worth of sales, these screen shots are fake and are shown to lure you into a false sense of security so you pay them there 10$ fee, to show you how its done. Blogging is one of the most written about ways of making money on the net. Some people think that it is the best thing since sliced bread while others feel that there are many more profitable ways to spend your time online. I believe that it can be a good way to make money but the problem is that it takes time to do. It might take a couple of months before a new blog starts to get enough traffic to be profitable. Other methods of making money online such as affiliate marketing don’t take as long to see results. So if you have a little patience and love writing blogging may be for you. If you want to have a go at blogging I would start with either the Blogger or WordPress platforms. You can get your blog up and running without having to worry about buying a domain name or hosting charges. They also have some great tools that make managing your blog and updating it easy. You can also use plugins to add extra features to your blog such as videos and music and there are also plugins to make your site search engine friendly. While these are good sites to learn how to blog on if you really want to make money blogging it is much better to host it yourself. Once you have chosen the topic for a blog you can choose a domain name that is related to it. This is incredibly important for getting the traffic your blog needs to be a success. You can look for available domain names on GoDaddy and HostGator. When you have chosen an appropriate domain name and a hosting plan you can start creating content for your blog. Here you should be writing with both the search engines and your readers in mind. Optimise your posts with relevant keyword for the search engines but don’t use so many that it becomes unreadable. A keyword density of around 3% is the recommended level. You should also be using various SEO techniques to promote your blog to boost the amount of traffic it gets. While I had Adsense on my sites for quite a while, I have never really gained much from the programme and took a year or two to accumulate sufficient earnings for payouts to occur. Yet, over the past week or so, my Adsense earnings suddenly shot up. Within the span of days, I had accumulated a large number of Adsense clicks and saw my Adsense earnings skyrocket. It suddenly hit home that Adsense, and perhaps other online advertisings as well, is a truly feasible way to make a living. The key point to making Adsense work for you is to write the right articles. I had been writing articles based on my own interests and perhaps my interests were not exactly that popular and searched for by people. To make money out of Adsense, it is important to write for the masses. Write articles that people are interested to read, articles that touch on the hottest topics of the day, articles on topics that are trending up. 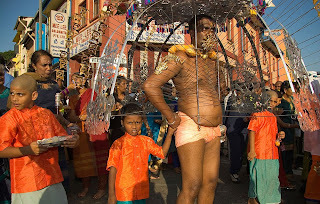 Escaping from the confines of a cubicle or a classroom for a fun-filled vacation is something most people dream about. The good news is that you can enjoy your holiday without spending exorbitant amounts of money. Read on for tips on how to stretch your vacation and your budget. Think about what you'd really like to do on your vacation and create a list to narrow your choices - whether it's hitting the beach, going shopping, climbing a mountain or visiting a museum. Consider whether you can do this somewhere nearby, or whether you know anyone who has done your chosen activities before on a similar budget. Alternatively, travel agencies or even chat rooms on the topic can provide great advice on accommodations, places to dine, things to do and tourist traps to avoid. Internet sites such as Yahoo! Travel, Expedia and Priceline are often useful when seeking reasonable fares. Peruse newspapers, magazines and websites for advertised deals (or coupons) on items like hotels, rental cars or other methods of transportation you'll be using. Major airlines also offer some good money-saving packages, and many clubs or organizations offer discounts to certain demographics such as students and senior citizens, so be sure to ask vendors what discounts are available and whether you qualify. Booking online can often save you up to 30%. Don't just call the hotel and airline directly to make reservations; call them to inquire not only about price, but also to determine whether any of the travel websites enable you to plan, price and book the trip online. Many travel websites direct travelers in bulk to certain destinations, which can mean cheaper rates than you'd be able to fetch on your own. 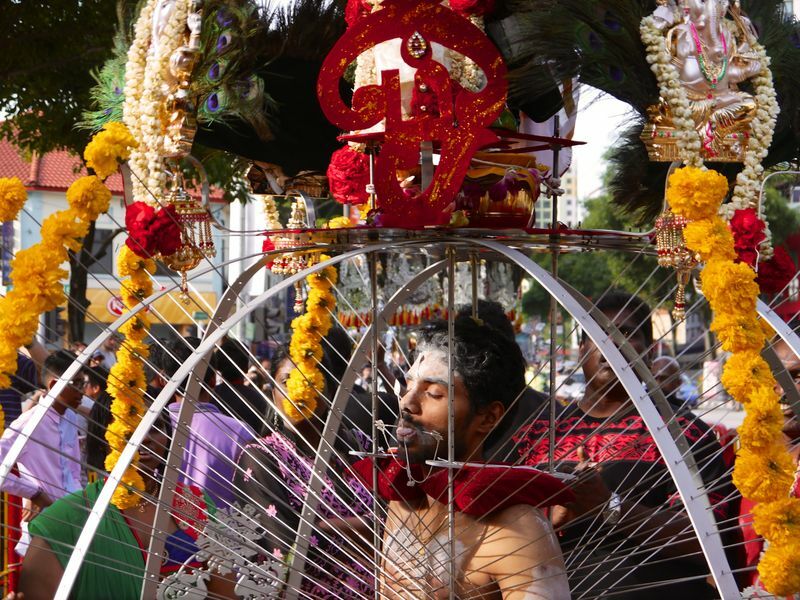 In addition, some travel organizations offer discounted rates to groups, when asked. If you don't ask, you might not be offered the discount - and don't forget to negotiate! Many parents don't have the luxury of spending time with the kids all summer. Summer camps can be an affordable way to ensure your children are in a safe environment and give you some time to yourself. To save money, it is often less expensive to send kids to camp in shorter two- or three-day trips throughout the summer rather than for five or more consecutive days. Day camps that bus children to daily activities are an option that cuts the costs of food, lodging and full-time staff. Early registration can also provide discounts, and many camps also offer gift certificates - which might be an ideal birthday or holiday gift for your child or someone you know. If you're looking to stay or travel close to home, chances are you'll be relying on the family car. Therefore, it makes sense to ensure that the vehicle is operating properly. In addition to offering roadside assistance (for a price) if necessary, the American Automobile Association (AAA) can help you find a car, and obtain financing and automobile insurance. AAA also offers travel discounts on hotels, cruises and other travel-related items. AAA even offers lower rates at many local merchants. Certain destinations are in high demand during certain times of the year. As a result, traveling when everyone else wants to travel can become quite expensive as merchants hike prices during these peak seasons. If you can avoid traveling during a peak season, you can potentially cut costs by 10-50%. Another benefit of avoiding peak season is reduced competition for certain landmarks and attractions. Fewer people means smaller lineups and better photo opportunities. Time of day is another consideration. For example, a theater matinée is often cheaper than the price at night. Time of day can also affect the cost of air travel. If your travel plans take you out of the country, high fees related to currency exchange can leave you with a bitter aftertaste. You can easily save a few extra dollars by conducting a pretrip investigation. The best conversion rates are generally found in the country to which you are traveling. However, don't whip our your wallet at the airport, where exchanges tend to be pricey. Instead, head for automated teller machines affiliated with major banks. Also, be sure to check your credit card company's exchange rates before you leave. You may be charged 1% for conversion as well as a 1-2% service fee. This is generally less than what you'd pay if you were exchanging cash or traveler's checks. Banks take a dim view of customers who pillage their accounts by withdrawing money they don't have. Frankly, doing this is just shooting yourself in the foot, because banks have a record of every transaction from every ATM. Using this information, banks can and do track down every unauthorised withdrawal and demand immediate repayment. In the meantime, you'll be hit by sky-high charges for creating an unapproved overdraft. Thus, the banks eventually get their own back on cash-machine bandits! They could take your money and all you’d be left with was a sense of bafflement, but after a three-month investigation the five-person “cash claw” gang have now been jailed for a total of 71 months. Their plan was ingenious. 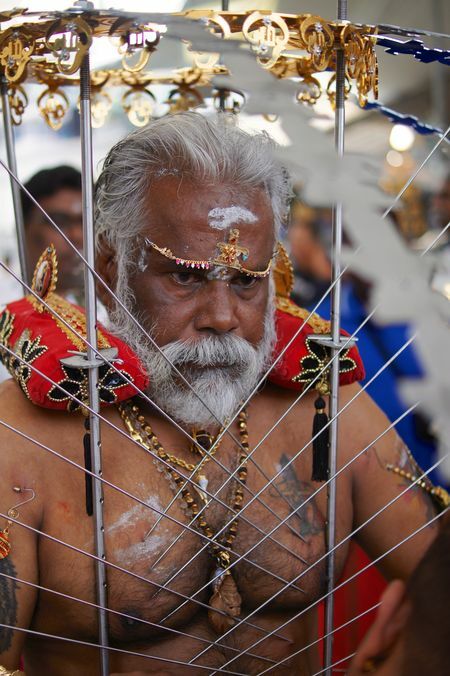 While we’ve all become aware of the risk of skimming, card cloning, people hovering over your shoulder or using miniature cameras to record your PIN, this gang cut out the middle man. They just wanted the cash, not the card details, so that’s what they targeted. As internet users we’re all vulnerable to online scams. Unluckily for us, as soon as we become pretty good as spotting one type of attack, another more sophisticated version comes along in its place. In fact, technology company, Mozilla - which developed the Firefox web browser - has warned against a possible threat from a new scam known as ‘tab napping’ which takes phishing one step further. Even as Singapore’s overall crime rate fell by 1 per cent last year, love cheats on the internet duped over 800 victims into parting with $37 million, an increase of more than half of the amount reported in 2016. 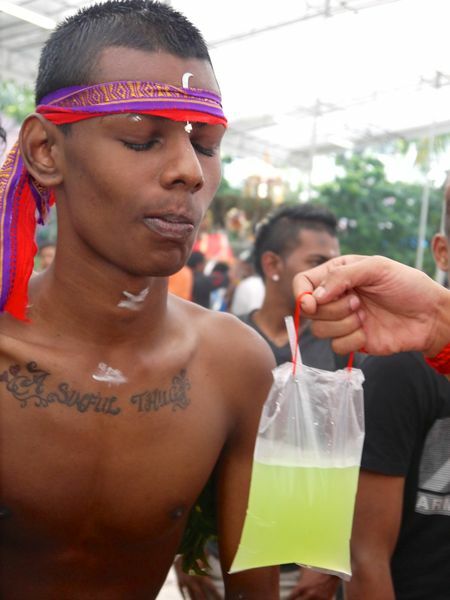 Also of concern last year was a 60.5 per cent rise to 207 cases of outrage of modesty (OM) on public transportation, and a 33.8 per cent increase to 107 OM cases at entertainment night spots, said the police at an annual crime briefing on Saturday morning (3 February). 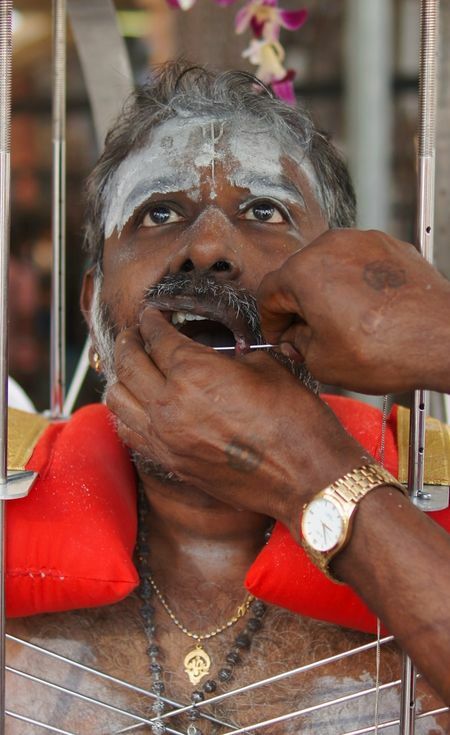 Overall, OM cases increased by 22.2 per cent to 1,566 cases in 2017. Singapore saw a sharp rise in online crime cases last year, with men making up the biggest group of victims: More than a thousand were tempted into handing over money for sexual services that never materialized. There were slightly over 1,200 such cases, up from just 66 in 2014, according to annual police crime statistics released yesterday. 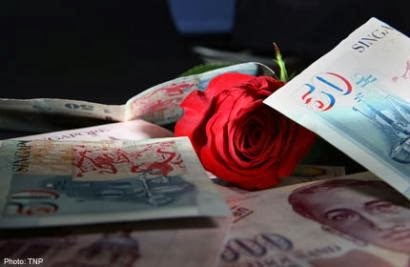 Soaring numbers of Singaporeans - mostly women - are falling victim to "Internet love scams" police said in a Valentine's Day warning that criminals are exploiting lonely hearts increasingly turning to the web to find partners. The number of people robbed by online con artists faking romantic interest before tricking people out of money jumped 62 per cent between 2012 and 2013, police said in an annual crime briefing. Official figures also show e-commerce rackets doubled to 509 in 2013. The total amount reported lost to such forms of fraud in 2013 was $6.01 million, police said, a steep rise from $1.20 million in 2012. 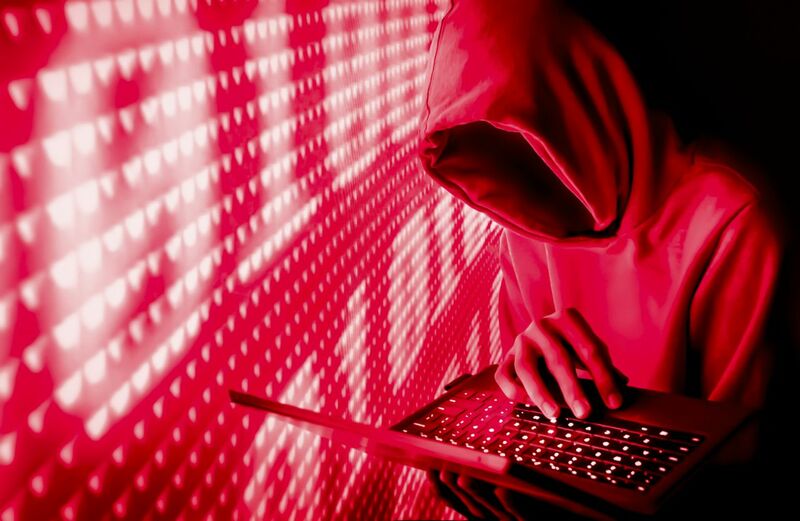 Police said the victims of the online love scams were mainly women searching for partners in social networks and on dating websites. 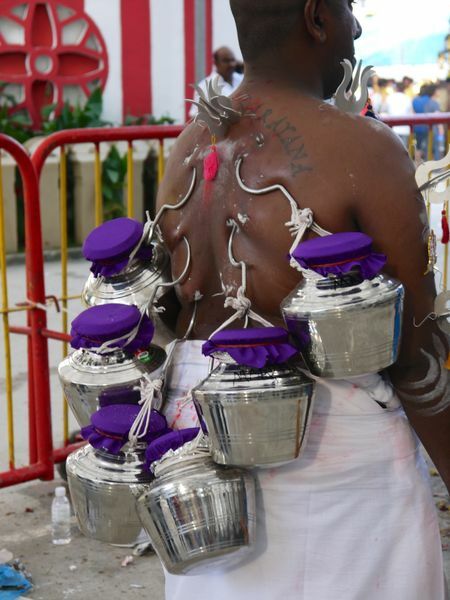 Thaipusam is a Hindu celebration of devotion, occurring on the full moon in the Tamil month of Thai (Jan/Feb). 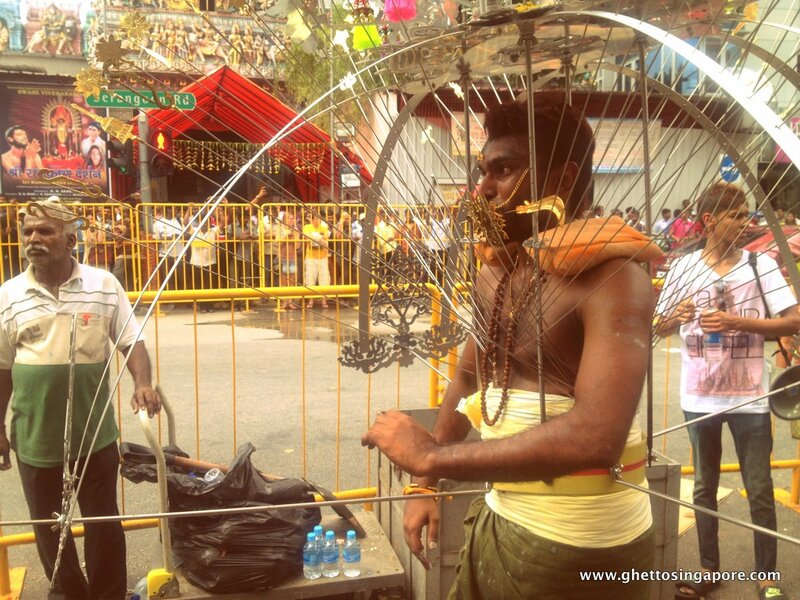 It is a time to give thanks to Muruga, the son of Shiva. 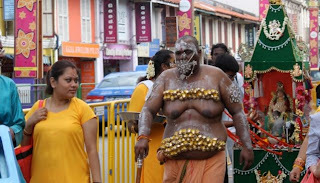 Thaipusam is celebrated in many places around the world, with the largest observances in India, Singapore, and Malaysia. 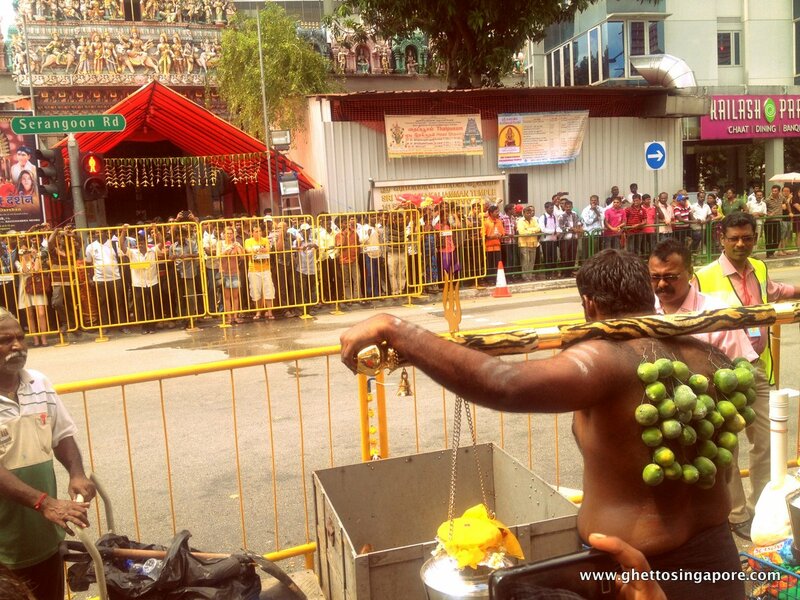 Aren't we lucky it is celebrated here in Singapore! My friend H and I went last year (click here to see the photos) and were mesmerized by the event. 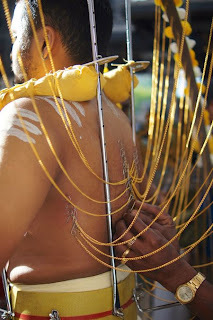 At the end of my post I wrote... “next year, I hope to get to see the actual piercing take place”…. well guess what? 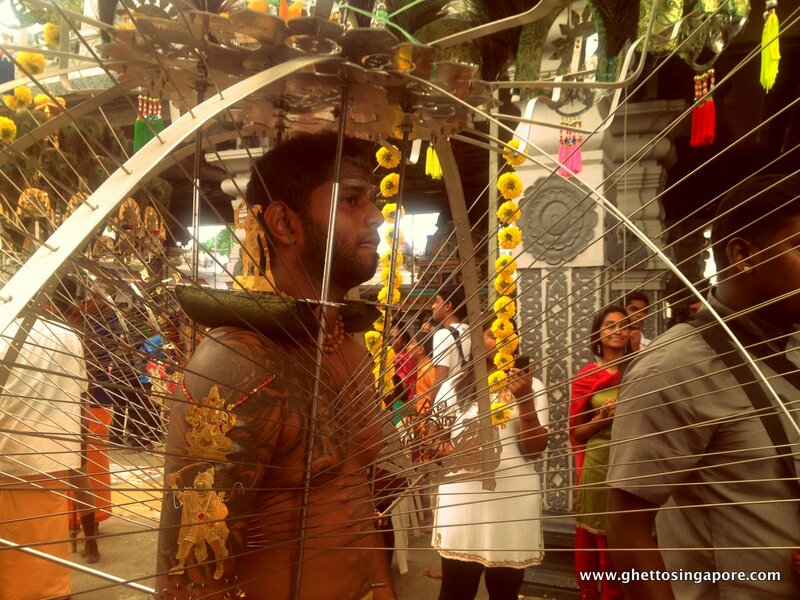 We went to the temple and saw the actual piercings! Oh my. 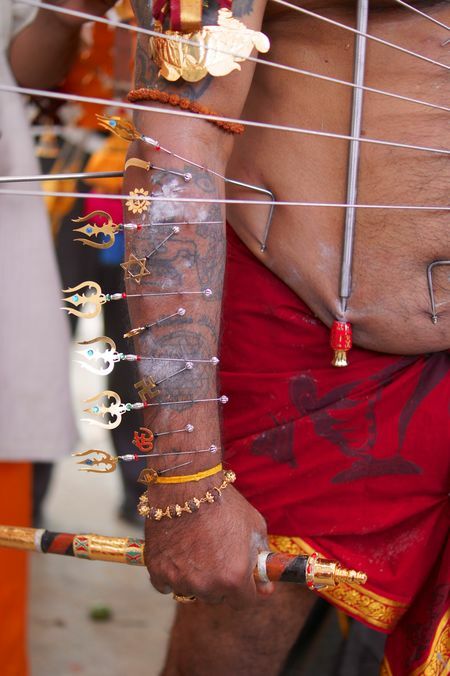 If you are bothered by needles or piercings, you probably should not read any further! Thaipusam this year was on 27 January. I spent the day at Sri Srinivasa Perumal Temple and followed the kavadi-bearers on their procession along Serangoon Road. 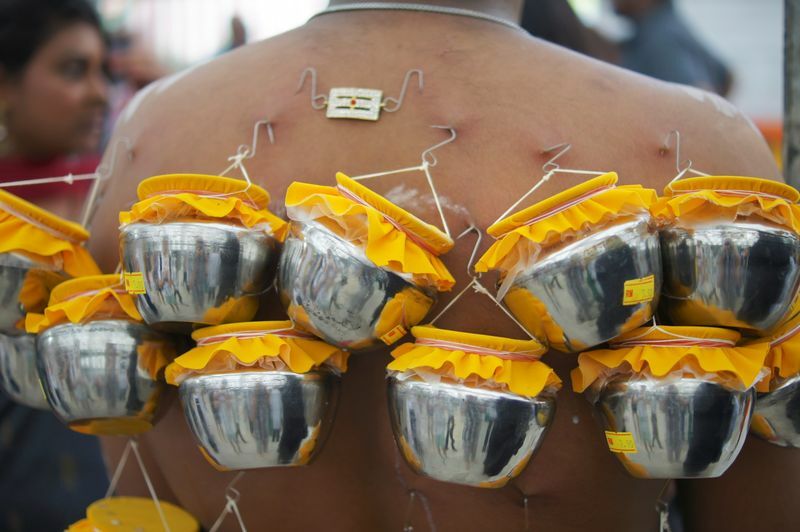 One of the most physically agonising of religious festivals, Thaipusam is a test of faith for believers and a stunning visual spectacle to outsiders. From the main thoroughfare of Serangoon Road, kavadi-bearers carry three to seven-foot-high structures of wood or steel and brace themselves for a 4.5km walk from Sri Srinivasa Perumal Temple to Sri Thandayuthapani Temple at Tank Road. 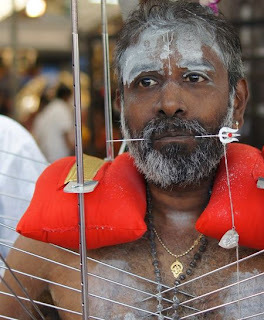 And if that isn’t physically strenuous enough, some devotees also pierce their tongues, torsos, and lips, with hooks and skewers attached to the kavadi. 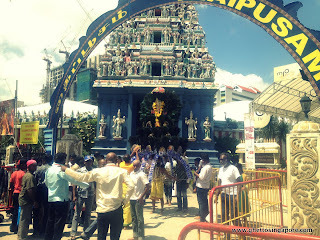 Along the way to Sri Thandayuthapani Temple, also known as Murugan Temple or Chettiar’s Temple, devotees chant hymns in praise of their god. 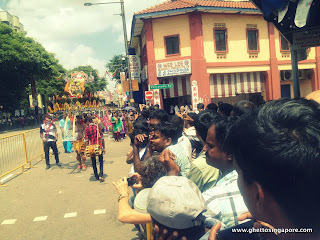 Many locals and tourists stand ready with camera gear alongside the special lanes for the kavadi-bearers and supporters, cheering them on. 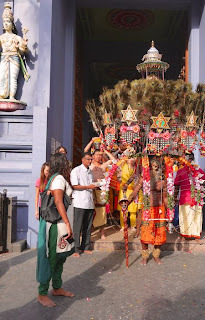 To prepare for their long and heavy journey, devotees gather at Sri Srinivasa Perumal Temple along Serangoon Road in Singapore’s Little India during the early hours. While praying and chanting to dizzying rhythms of drums, a priest attaches a spiked Kavadi on the shoulders of a male devotee while the extended family watches on for support. 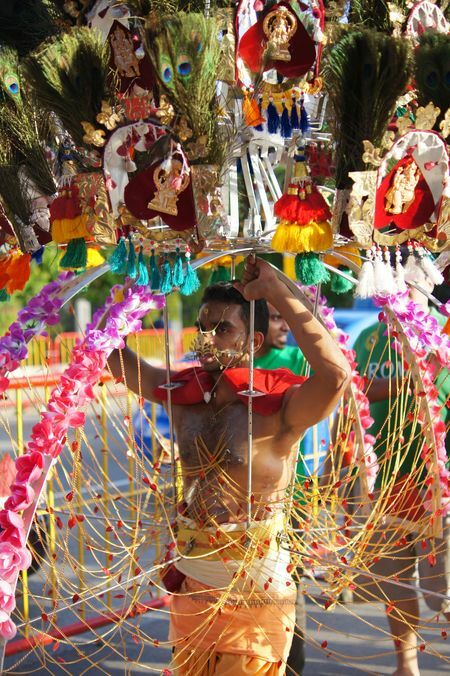 A Kavadi consists of two semicircular wooden or steel pieces and it is decorated with flowers, palm leaves and colorful peacock feathers. 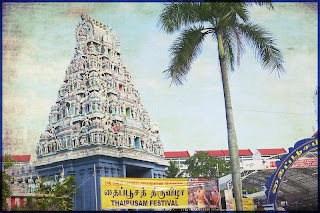 After several hours of preparation in the temple, devotees, accompanied by a large group of family and friends, leave one after the other the Sri Srinivasa Perumal Temple to go on the 5km walk to join Sri Thendayuthapani Temple on Tank Road. 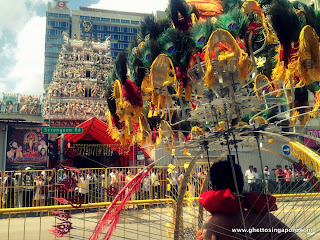 The festival is known mainly to insiders and locals but still attracting quite a crowd, so expect traffic to come to stand still in some parts along their way through Little India. Thaipusam (Tamil: தைப்பூசம், Taippūcam) Thai Poosam is a Hindu festival celebrated mostly by the Tamil community on the full moon in the Tamil month of Thai (January/February). 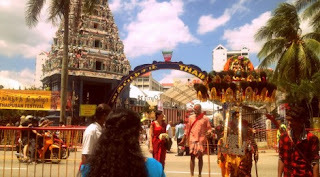 It is not only observed in countries where the Tamil community constitutes a majority, but also in countries where Tamil communities are smaller, such as Malaysia, Mauritius, Singapore, Thailand and Myanmar. 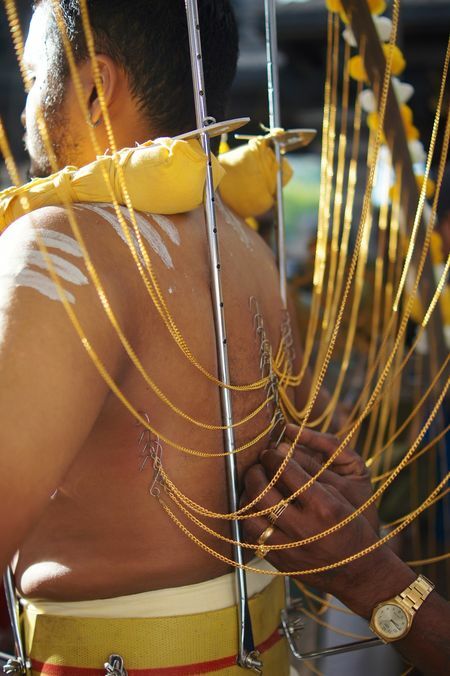 The word Thaipusam is a combination of the name of the month, Thai, and the name of a star, Pusam. 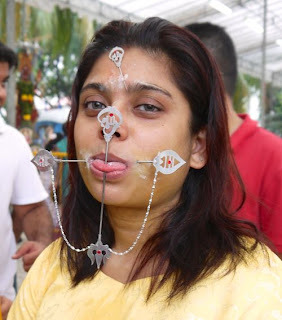 This particular star is at its highest point during the festival. 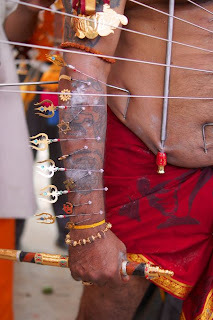 The festival commemorates the occasion when Parvati gave Murugan a Vel "spear" so he could vanquish the evil demon Soorapadman. 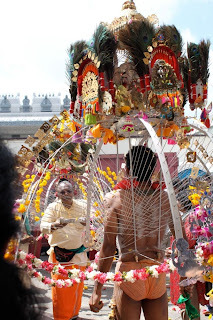 This Hindu festival commemorates the feats of the Hindu God, Lord Subramaniam son of Lord Siva. It also acknowledges Subramaniam's triumph over the evil forces. According to the legend, devas or celestial beings at one time were so plagued by the asuras, or demons, that they pleaded with Lord Siva, to help them. 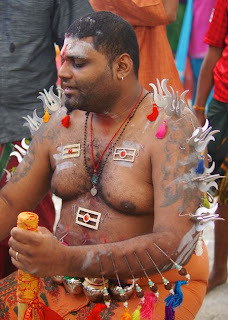 Touched by their pleas, Lord Siva sent his son Subramaniam to conquer the asuras. 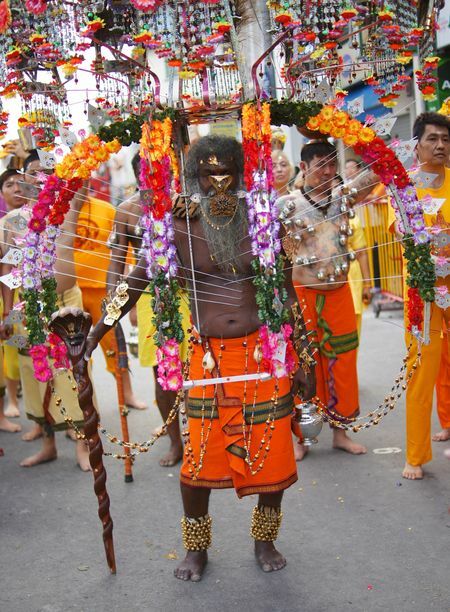 After accomplishing this task, the victorious Subramaniam was believed to have appeared before his devotees. 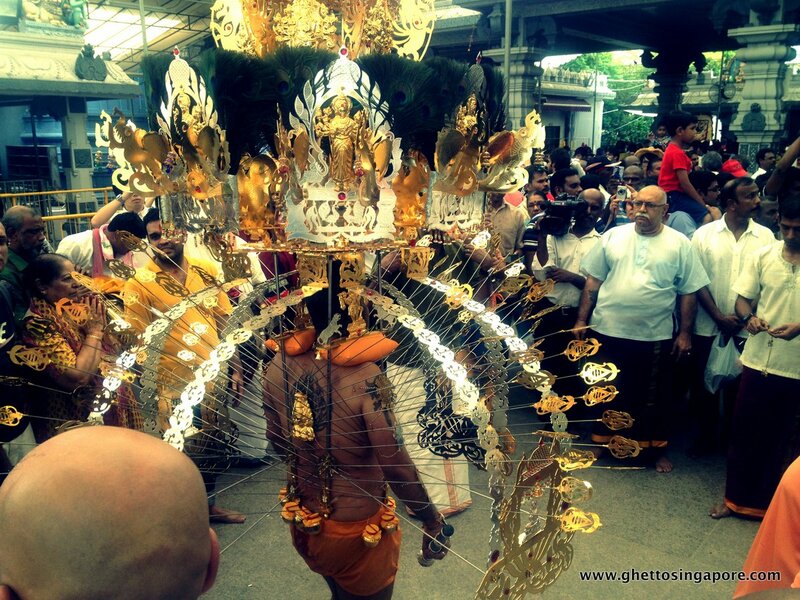 In the vision, he was bedecked with brilliant jewels, armed with a golden spear and seated on a chariot. Thus, on Thaipusam day, Lord Subramaniam's image, adorned and decorated, is placed on a silver chariot before his devotees. 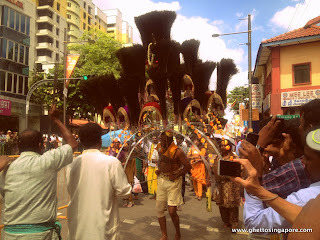 This is then taken in a procession the day before. 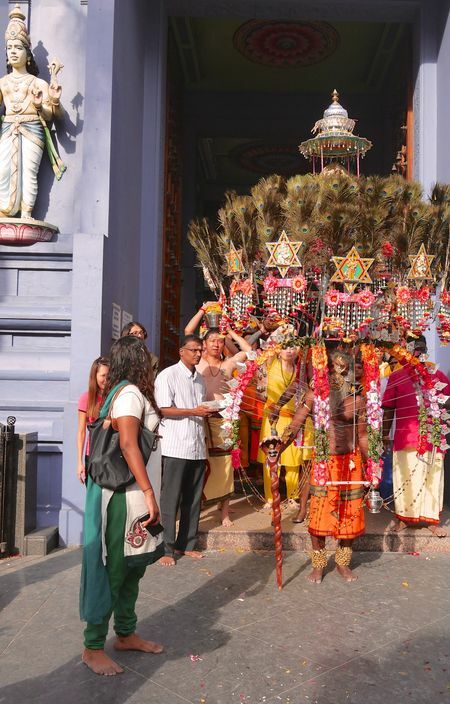 Besides being acknowledged as a symbol of virtue, bravery, youth and beauty, the Hindus believe that Lord Subramaniam is also the universal dispenser of favours. 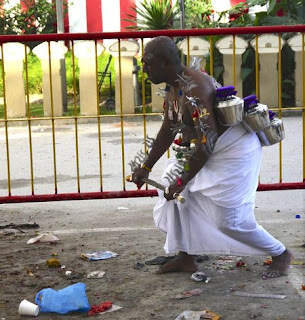 Hence, some who have made vows and pledges to Lord Subramaniam prove their gratitude to him by undergoing self-mortification on Thaipusam day. The most popular form of sacrifice is the carrying of the kavadi which means "sacrifice at every step". The symbolism of carrying the kavadi originates from a myth where the kavadi represents a mountain with Lord Subramaniam at its apex. 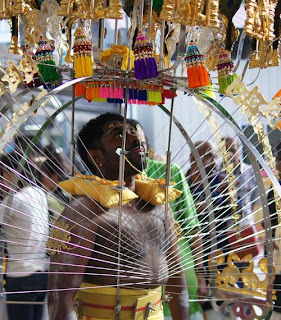 The smaller, semi-circular kavadi is a steel or wooden frame with bars for support on the shoulders, normally decorated with flowers and peacock feathers. The larger ones with spikes can weigh as much as 40 kg and reach a height of four metres. 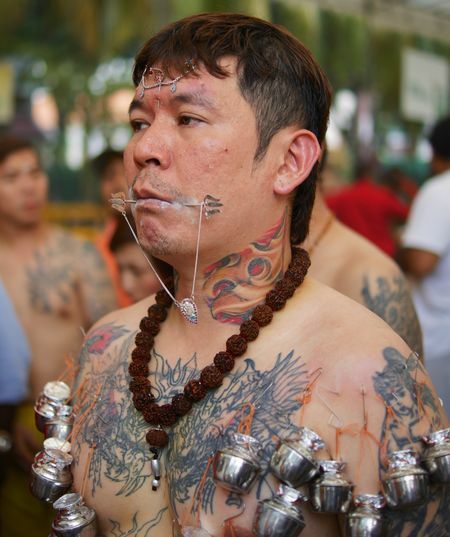 Other forms of sacrifice include piercing silver pins through the cheek and tongue and pricking the body with hooks and spear-like needles. 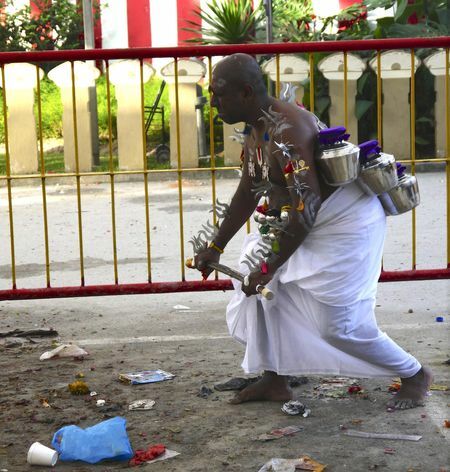 The devotees who intend to perform the sacrifice are customarily required to observe strict physical and mental discipline. Throughout the tenth month of Thai, purification of the body is a necessity. This includes taking just one vegetarian meal a day, and sexual abstinence. 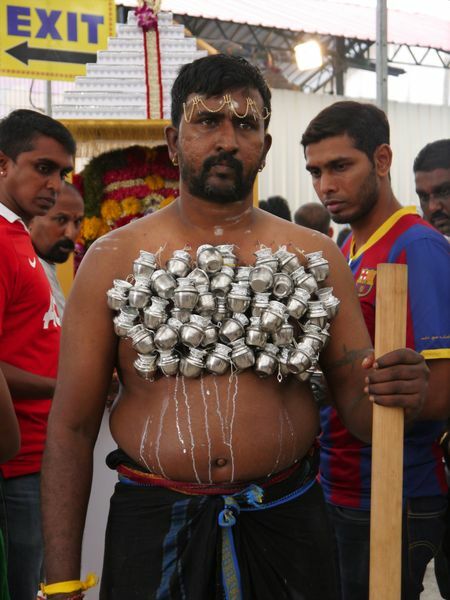 In addition, a 24-hour fast is observed on the eve of Thaipusam. Most women devotees carry a pot of milk called a palkuddam. 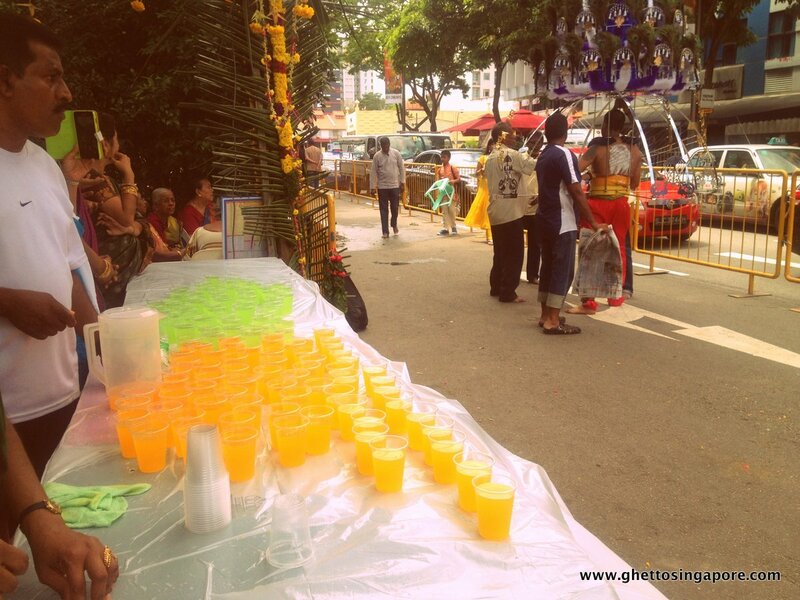 The milk is poured over the statue of Lord Subramaniam after the procession. In Singapore, this Hindu festival starts at the Sri Srinivasa Perumal Temple at Serangoon Road. 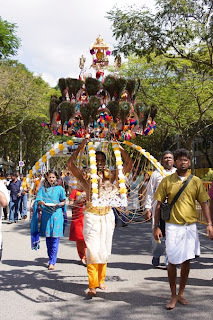 The kavadi carriers, together with their relatives, friends and well-wishers congregate here in the morning to participate in the procession which will take them through Serangoon Road, Orchard Road and finally to the Sri Thandayuthapani Temple at Tank Road, commonly known as the Murugan Temple or Chettiar's Temple. 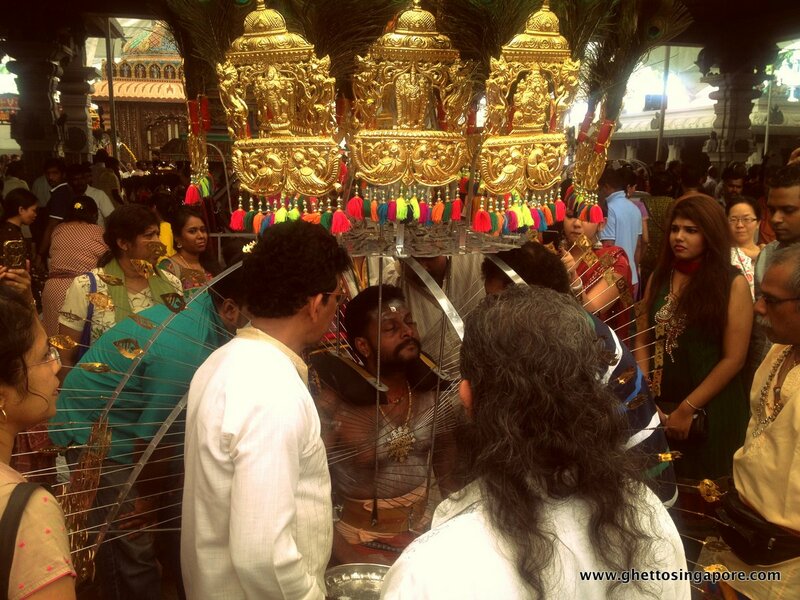 All along the way, devotees chant hymns in praise of the deity. 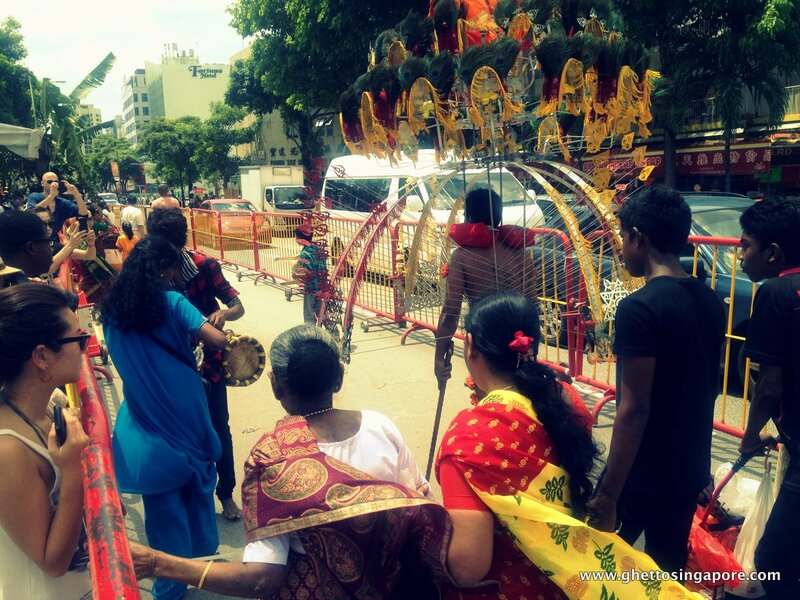 The kavadi carriers' arrival at the Murugan Temple at Tank Road marks the accomplishment of their task. A mixture of fruits and honey is prepared and distributed among the devotees.